Remember when we used to measure a band’s success by the amount of friends they had on MySpace? With that particular social network suffering a steep decline over the past couple of years, how are the bands who found initial admiration and masses of comments on there faring these days? Never Shout Never are one such band which amassed a legion of fans on MySpace, and as their biography boasts, they’ve managed to keep on amassing fans in the era of Facebook. But, is it a case of simply being the band with the most picture comments, or is there something in their music to ‘Like’? 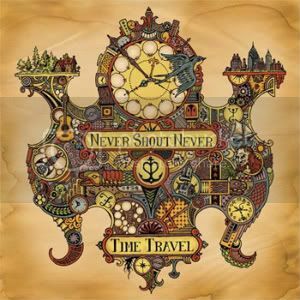 Masterminded by frontman Christofer Drew, NSN‘s third full-length sees them record for the first time as a full band, and ‘Time Travel’ benefits from this fuller-instrumentation, giving it a kick that its predecessors lack. Electronics dominate the soundscape; Drew‘s autotune-drenched vocals swirl amongst reverb-laden guitars and keys, while the drums give a very real contrast to the electronic-artifice. ‘Auto-tuned’ may have become shorthand for ‘crap singer’, but when Drew lets his own voice take over, like on ‘Simplistic Trance-Like Getaway’ (a song you’d perhaps expect to be crammed with all kinds of effects with a title like that), you can hear an appealing voice that is strong enough to hold its own in a sea of synthesised sounds. The track is a highlight – a good example of how NSN are using the full band setup to their advantage. It’s the guitar, bass and drums that hold this pop-rocker in place; the synths are subtle and give the song a soft, trance-like feel, as the title suggests. The ‘real’/’synthesised’ balance isn’t always kept in check, mind. The album’s title-track is over-egging the synths a bit, losing that solid base that the band provides, resulting in a loss of potency in the song. The name-dropping of drugs in the verse may put over Drew‘s desire to create a (according to the biog) “trippy” sounding record, but doesn’t really show the maturity that he’s (again according to said biog) gained from his first upload. Never Shout Never wanted to experiment with their new setup on this record, and the result stands somewhere between the more-experimental albums of Panic! At The Disco and Thrice (‘Pretty.Odd’ and ‘The Alchemy Index’, respectively). It has the kooky-ness of the former and the bold use of all manner of instruments of the latter, which makes for an interesting listen to say the least. There’s an orchestrated chaos in ‘Complex Heart’; its calm, swaying verses are contrasted with a discordant, stabbing refrain, reflecting the conflicting sentiments of the lyrics. ‘Lost At Sea’ is lyrically heartfelt, and is a short-but-sweet conclusion to what is, generally, an enjoyable, if somewhat eccentric release. With a quick read of their biog and its boasts of Internet fame, the cynics amongst us may form a pigeonhole for Never Shout Never that, after a few listens of ‘Time Travel’, will not be filled with a metaphorical pigeon. The pre-chorus of the title-track provides apt advice for approaching this record, “Take this for what it is / I think you’re a tad bit prejudiced”. Drew knows me so well. Take his advice – there’s a pretty good album to be heard once you get past the MySpace stereotypes. NEWS: Switchfoot announce November UK headline tour! ALBUM: NeverShoutNever – What Is Love? NEWS: Tonight Alive to support Never Shout Never on UK tour! NEWS: Hit The Deck Festival announce first wave of bands and Bristol date for 2013! NEWS: Never Shout Never reveal details of new full-length album, ‘Sunflower’!